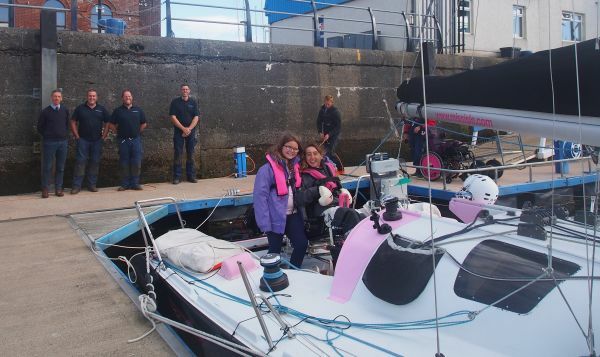 Natasha has completed her latest challenge – Sea and Summit, Scotland. She arrived at Clyde Marina at 4.30 on Thursday, Fourth August after a lively sail from Largs, on the Firth of Clyde. 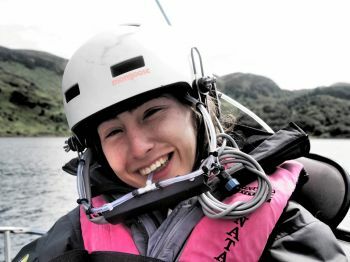 Natasha Lambert, 19, has climbed Cairngorm mountain, sailed through Lochs and Sounds in the Highlands and negotiated two famous Scottish canals, the Caledonian and the Crinan. Such adventures would be taxing for any young person, but Natasha has athetoid cerebral palsy. She uses a wheel chair and has little control over her movements and speech. The expedition began at Inverness marina on Monday 18 July after months of planning and training. For the sailing part of the challenge she took to her adapted twenty-one-foot yacht Miss Isle Too, which she sails using only her breath. To tackle the mountain Natasha used a Hart Walker. This device allows Natasha to stand upright which then means she can propel herself forward. The ascent and descent of the famous Cairngorm mountain, the sixth highest peak in Britain, took over five and a half hours. A support team, including her parents, sister and a safety adviser from the Mountaineering Council of Scotland, were on hand to help Natasha up and down over the steep, rough terrain and to celebrate on the very windy peak. Footage of the climb gained tens of thousands of admiring views on social media. Back on the water Natasha spent many hours sitting in the special canting seat in her yacht. Natasha’s condition means she needs to be in the seat every moment she is on board. This is especially challenging on the canals when she can spend hours waiting to go through locks. At no time did Natasha opt to get out of the boat, other than on the Crinan Canal when she took to her walker to learn how to operate the manual locks with the rest of her team. Natasha undertakes her challenges for two reasons, to raise funds and to raise awareness. She has already received a British Empire Medal for her previous fund raising efforts. This time she is raising funds for her charity, the Miss Isle School of Sip Puff Sailing. The School gives young people like Natasha the chance to get out on the water and sail, using their breath to control the boat. The raising of awareness is equally important to Natasha as she grows older. Her level of determination is becoming well known. It’s this that she hopes will inspire others with similar conditions. Rather than taking a traditional holiday Natasha and her family embark on the challenges to highlight just what can be achieved despite the pressures and needs arising from Natasha’s condition.